Science and Religion, finally reconciled! Since its publication in 1859, few books have caused more uproar than Charles Darwin’s infamous The Origin of Species. This heretical book was a shot fired across the bow of traditional Christian beliefs in the 19th century, and has contributed to the slow descent into the decadence so emblematic modern society. But for years, the faithful have been excluded from meaningful debate on this vile treatise, because of its undeniable effect of transforming good Christians into godless secularists. Now, you can see what all the controversy is about for yourself, without fear that you may accidentally damn your immortal soul to hell. Darwin's never looked so right! 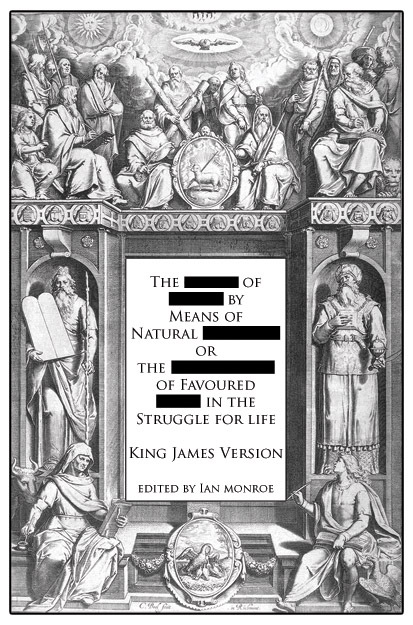 For the first time, Darwin’s dangerous ideas have been published, with every word which doesn’t occur in the King James version of the Holy Bible safely redacted. By removing more than 33,000 references to non-KJV terms, we have finally succeeded in translating this demonic work into a safe manuscript, appropriate for high school biology classes, as a text for homeschooling, and even for discussion in Bible study groups. Enjoy this new edition without worry of incurring the wrath of the Almighty, and share it with your friends, family, and congregation! Want to see a preview? Click here! The _____ of _____ by Means of Natural _____ is also available as a free download. Click here for details. This weblog appears to get a great deal of visitors. How do you get traffic to it? It gives a nice unique twist on things. I guess having something real or substantial to post about is the most important thing.